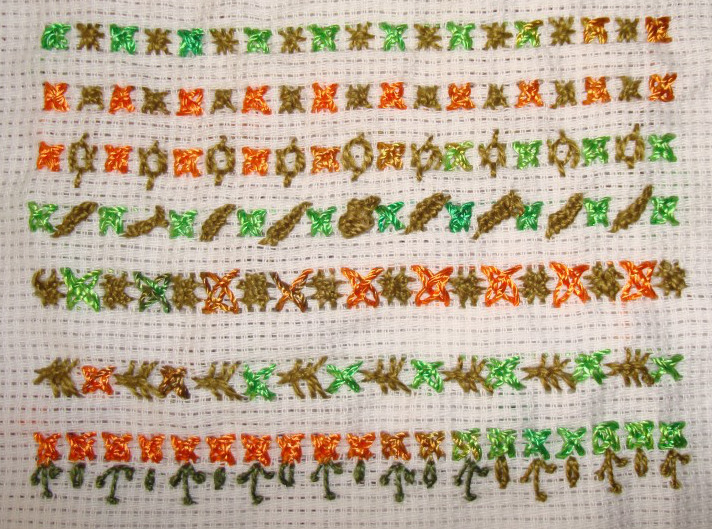 I tried some isolated stitches with woven cross stitch in this part of the sampler. Double cross stitch, raised cross stitch flower, reverse fly stitch, woven detached chain stitch and laced herringbone square. 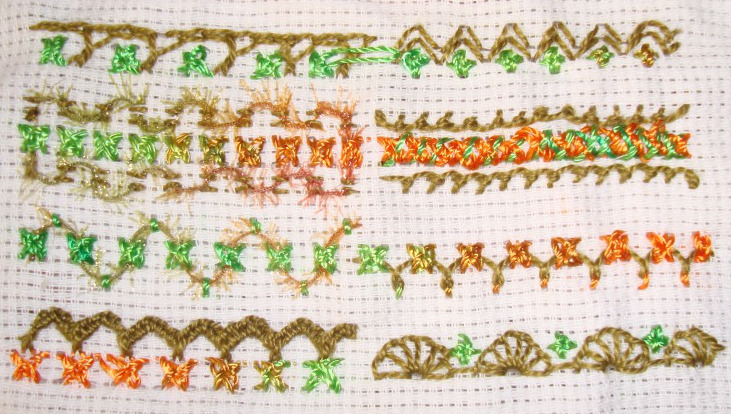 10.In these two samples, Vandyke stitches, pistil stitches and detached chain stitches are worked with woven cross stitches. Woven cross stitch with other TAST stitches. Badly worked crested chain stitch, two rows of arrowhead stitch, laced running stitch and scroll stitch. 8. The first sample is laced woven cross stitch and other stitches are – Pekinese stitch, buttonholed herringbone and buttonhole wheel variation. 4. 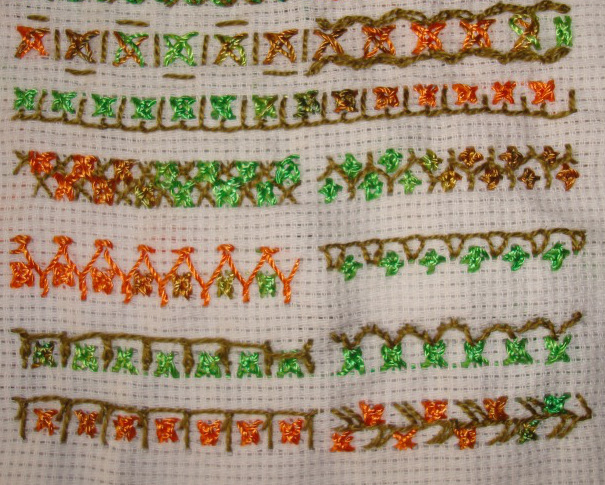 Running stitch is worked going around the woven cross stitches in the first part of the first sample, and zigzag chain stitches are worked on both sides of woven cross stitches. The stitches are worked with buttonhole stitch variation in the second sample. Basque stitch, stem stitch curve, up and down buttonhole and feather stitch variation. Last week we were in Edinburgh, Scotland for a few days, so I did not have time to explore last week’s stitch. This week’s woven cross stitch on the TAST 2013 challenge by SharonB was one of the stitches I missed during the previous challenge. I am happy this gives me the opportunity to explore this stitch. 1.I want to try this stitch as line and isolated stitch, starting with the basic stitch, moved on to alternating the small and big ones, worked the zigzag version and alternated the square and upright version. 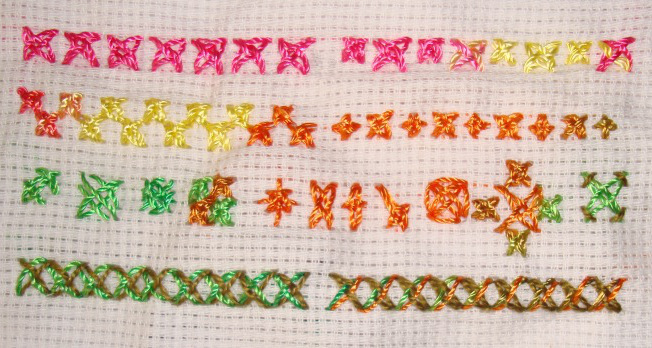 2. the variations here are worked on individual woven cross stitches. The weaving is more than two in the first three samples. The next sample is done in two colours, then followed by woven cross stitch worked- over a cross, as an ablong cross, with one diagonal short, with a tail, within a square, with four small woven cross around a medium woven cross and as rice stitch . 3. Woven cross stitch worked with two colours. The basic cross is worked with one colour and the weaving cross is worked with another colour. In the second sample, the journey from left to right was done in one colour and the journey from right to left was done in another colour.